A model for the West today? 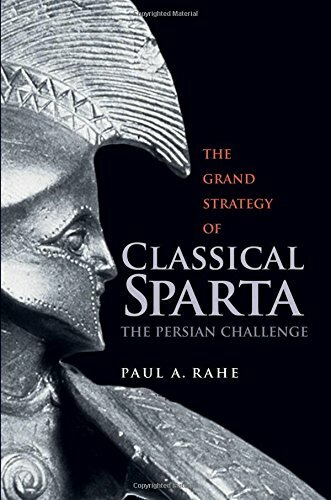 At the beginning of his new book, The Grand Strategy of Classical Sparta, Paul Rahe quotes a passage from John Stuart Mill—an 1846 passage in which Mill writes that Ancient Greek history is "unexhausted and inexhaustible," an epic poem written in action rather than words, and all subsequent history flows from that original Greek source. It's a kind of Victorian blather, of course, a genuflection toward the classics, but Mill isn't wrong, for all that. The Greeks provide tropes of politics and art that influence us, even now—and more than influence us, Rahe insists: Classical Greece continues to shape civilization, whether we know it or not. As it happens, Mill and his fellow Victorians mostly did know it, while people today mostly do not. But since we are still living in the world the Greeks defined, we would do well to study anew their lessons—the lessons of the Spartans, in particular, Rahe thinks, and especially their clever, brutal, and brave role in the 479 B.C. defeat of Xerxes, the great king of Persia. Rahe, a widely published historian and political theorist at Hillsdale College, is perhaps best known for his 1992 volume Republics Ancient and Modern—a magisterial 1,200-page survey of democracy from Ancient Greece to the American Founding. In such later books as the 2008 study of Machiavelli, Against Throne and Altar, and the 2009 Soft Despotism, Democracy's Drift, he has extended his work with serious and provocative accounts of modern political formation. And in his recent thought about Sparta, he has gone back again to inexhaustible Greece, seeking insight about war and international politics in the crisis caused for Sparta by the Persian Empire's attempts to expand out of Asia Minor and into Europe. In looking to Sparta, Rahe may appear to be joining the recent trend of popular fascination with those laconic Greeks—a trend exemplified by such popcorn as the wildly inaccurate but fun comic book and 2006 movie 300. But, in fact, Rahe is bucking the trend of the academic world in which he has his being. Just as, in the 19th century, studies of Ancient Greece generally came to seem deeper and more important than studies of Ancient Rome, so, in the twentieth century, studies of the art and politics of Athens came to seem more revealing about both human nature and our modern situation than studies of the military virtues of Sparta. Sparta has had its admirers down through the ages, as philosophers and political theorists tried to align the city's peculiar political and social arrangements with the ideals of government suggested by Plato in the Republic. But in modern times, Athens has generally won the intellectual battle to be the shining star, the bright center of our fascination, in the ancient world. And deservedly so, one has to say. The Spartans were a nasty and brutish set, a tribe of invaders ruling a long valley of slaves along the Eurotas River, in the south-east of the Peloponnesus. The traditional account identifies them as part of the migration of the Dorians out of northern Greece around 1100 B.C., as the older Mycenaean culture fell into the Greek Dark Ages. "The Return of the Heracleidae," it came to be called—a claim to resumed rule as descendants of the demi-god hero Heracles—and the invaders subjugated Laconia to make it their own. All of this very ancient history is dubious and much disputed. Were the Dorians the "sea people" who harried Egypt? Were they the cause of Mycenaean collapse? Was there really any such thing as the Dorian invasion? Even the life of Lycurgus, the ninth-century lawgiver who established many of Sparta's political institutions, remains shrouded in too much myth to be more than speculative. Still, the First Messenian War, from 743 to 724 B.C., is well attested, and it establishes a base from which to reckon subsequent Peloponnesian history. After expansionist victories over the cities of Messenia, the territory to the west of Laconia, Sparta crystalized into the society we now think of as distinctly Spartan. Most of the captured peoples of Laconia and Messenia were reduced to Helot slaves, while other Lacedaemonians were made into non-citizen freemen called perioeci—both of them distinct from the citizen soldiers of Sparta who were called Spartiates or homoioi: the alike, the peers, the (only) equal ones. With slaves massively outnumbering masters, it's not surprising that the Helots revolted in 685. It took the Spartans seventeen years to put down that revolt in the Second Messenian War, and they did so by becoming, in essence, a people defined by the rigors of military training. The result left Sparta the preeminent military power in Greece for the next two hundred years.